The Queen Elizabeth 2, or QE2 as she is commonly known was the flagship of the Cunard Line for nearly 40 years. 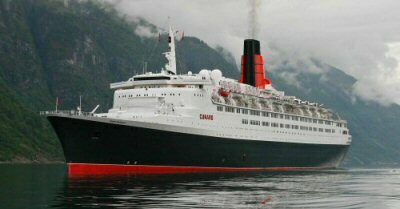 QE2 made her maiden voyage in 1969 and was one of the last great Transatlantic liners. At 70,327 tons and 963 feet long with a top speed of 32.5 knots she is also one of the fastest and grandest passenger vessels ever built. QE2 is arguably the most famous liner in the world. QE2 has been docked permanently in Dubai since being sold in 2008. The ship finally opened as a hotel on 18 April 2018. Out in April 2019, the long-awaited 4th edition of this definitive QE2 history. QE2: The Cunard Line Flagship, Queen Elizabeth 2 by Commodore Ronald Warwick and Sam Warwick.